AFTER READING PILES of background material to prepare for this story, I was struck by how few reporters concentrated on Delilah Rene’s Christian beliefs. Yet her writings are full of thoughts on how she interacts with God, why she prays, and how she hangs on after experiencing so much grief and sorrow throughout her 59 years. 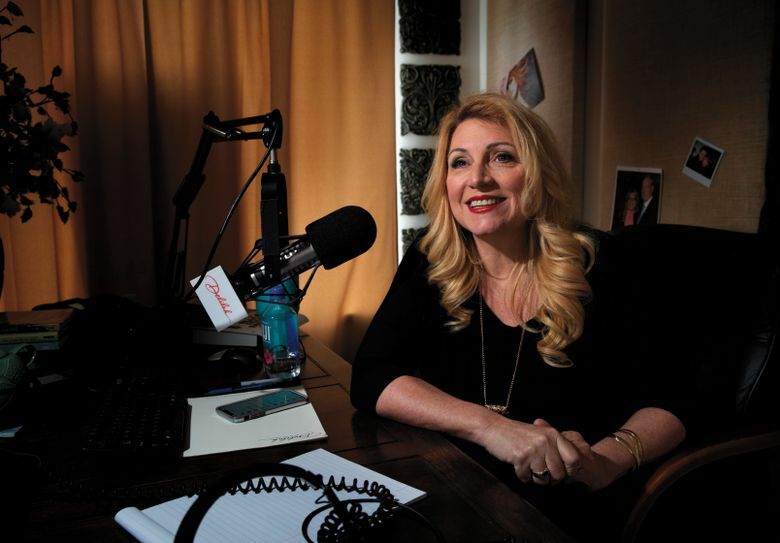 Delilah, who has been doing her radio show for more than 30 years, is the most-listened-to woman on American radio. Her religious conversion occurred in the late 1980s, after the collapse of her first marriage and the death of an older brother. She asked God to show her He was real, and the next day, while visiting Pike Place Market, she returned to her car to find a tiny New Testament on her windshield with a handwritten note saying, “Jesus loves you.” She professed Christianity for the first time the following weekend in church. When I asked Delilah what helps her through her travails, she mentioned the famous hymn “It is Well With My Soul,” and Job 13:15: “Though He slay me, yet will I trust in Him” as the Bible verse that gets her through lonely nights. Julia Duin is an Issaquah writer who profiles interesting personalities in the world of religion. Bettina Hansen and Ellen M. Banner are Seattle Times staff photographers.